We are participating in the Revolutionizing Prosthetics project organized by the Applied Physics Laboratory of Johns Hopkins University. This project aims to develop a neurally-driven upper extremity prosthesis with a dexterous hand. Our lab is contributing to development of methods for controlling a dexterous prosthetic hand from neural signals. 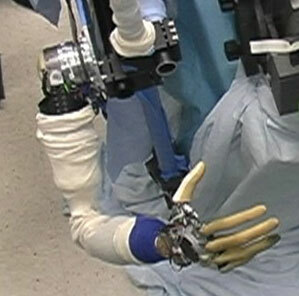 Revolutionizing Prosthetics arm and hand. Researcher: Marc H. Schieber, M.D., Ph.D.